You say you want a revolution? Too bad, because this Galaxy smartphone update is just that... an update. Samsung's newly unveiled Galaxy S 4 is an incremental step up, an evolution less "inspired by nature" and more by last year's GS III. Don't believe us? Just take a look at the two handsets side by side to see the overtly obvious heritage. Samsung's staying the course with the overall design language, though it's expanded the screen size to five inches -- now powered by a Full HD Super AMOLED display with 441 ppi (and yes, it's still PenTile). On the inside, it has a processor setup that we're told will be either an Exynos 5 or Snapdragon depending on the region, along with 2GB of RAM, 16, 32 or 64GB of internal storage, a 13-megapixel rear-facing camera and a 2,600mAh battery. Starting to see the bigger picture here? Samsung had a good thing on its hands with the GS III and it's not willing to compromise much of the tried-and-true with the GS 4. It will launch globally in Q2, with a stateside debut on T-Mobile, AT&T, Sprint, Verizon, US Cellular and Cricket. Until then, join us past the break for our detailed first impressions. You can take a look at our hardware gallery to confirm the comparison for yourselves, but suffice to say the key design language should seem pretty familiar. It's an intentionally plainer take on its predecessor, one that sees those formerly rounded edges ironed out in favor of a flatter silhouette. Its bezel has been reduced greatly, too, though you still won't find any hard angles. We can only presume Samsung did this to reinforce the device's sleeker 7.9mm thickness (versus 8.6mm on the GS III) since at 130 grams there's no tangible change in the weight. All of which means it feels great in the hand -- sturdy even -- and shouldn't strain your palm despite the marginally larger 5-inch screen. HTC can proudly boast about the One's aluminum unibody, LG can claim style points for its glass-plated Nexus 4 and the whole of Android's consumer base can whinge on about the need for premium materials in a flagship device, but it's all just background noise to Samsung. True to tradition, the GS 4 is an all-around plastic affair and, really, did you expect anything else? Although, the company has now injected that glossy body with a subtle cross-hatching that lies just beneath the surface on the front and back. The effect is reminiscent of the patterns used on the Optimus G and G Pro, but it's a decidedly inferior imitation that does little to elevate the GS 4's build quality. To the contrary, it actually seems to have a cheapening effect. You can somewhat avoid this with the Frost White version, as the pattern appears most distracting on the black model. As artillery in the 2013 smartphone spec wars, 1080p displays are a boon for manufacturers, especially as they jockey for the top spot in the Android space. In practice, however, you'd be hard-pressed to find a consumer who could truly appreciate the bump in resolution. That's not to say we're disappointed with the GS 4's Full HD Super AMOLED panel -- indeed, we're glad to see it -- but the increase in pixel density (441 ppi) is barely noticeable. The same goes for color reproduction, which bears all the hallmarks of AMOLED: it's bright and super-saturated. Impressively, we were able to read the screen from most every angle -- yes, even at a full 90-degree turn. The ports have been arranged in much the same way as they were on the GS III. 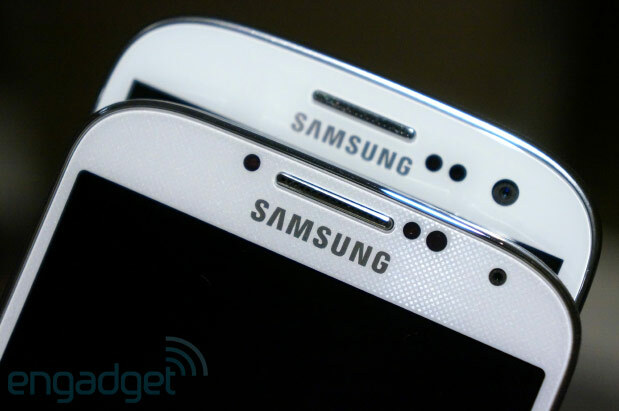 There are minute changes: the volume rocker is now a bit more refined and elongated, the speaker grille around back mimics the Note II's placement, the top edge now houses an IR blaster and the home button's taken on a more oblong shape. But that's about as different as it gets. The GS 4's backplate is still removable, still thin and still flimsy. It still conceals all the usual bits, too, like the 2,600mAh battery (which we worry won't last long given the additional pixels), a micro-SIM slot and a microSD reader. We can talk about the GS 4's performance, but we unfortunately can't quite put it into the proper context. Why? Well, for starters, the device will ship with two different region-specific CPU setups: an Exynos 5 Octa clocked at 1.6GHz and a 1.9GHz quad-core Snapdragon (likely the 600 based on speed and availability). Further, the company was unable to specify which arrangement lies inside the pre-production model we demoed. But based on our brief interaction with the device, we're willing to bet it wasn't of the Exynos 5 Octa variety. Navigation and UI actions were fluid and responsive, just not as blistering as you'd expect on an eight-core device. Whatever the eventual market reality, you can count on the GS 4 to pack radios for HSPA+ (850/900/1900/2100MHz) and LTE (six different bands in total), all according to regional demands. So, what's the real game-changer, then? 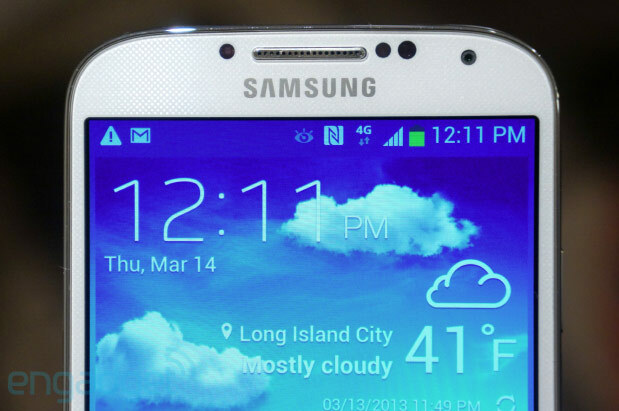 For Samsung, it's all about the TouchWiz software suite layered atop Android 4.2.2 Jelly Bean. And there's no shortage of it either. This time around, the company's taken the base it built with the GS III and Note products (i.e., Air View, Smart Stay), enhanced that functionality and introduced a plethora of new features, too. It's a dizzying array of options to be sure, although entirely emblematic of Samsung's approach to Android. It does make us wonder, though, whether the average consumer will even be aware of all these added bells and whistles. To its credit, Samsung's seen fit to toss in an additional drop-down pane with access to toggles for all of these add-ons, so you'll have that as a crutch. Now about those features. 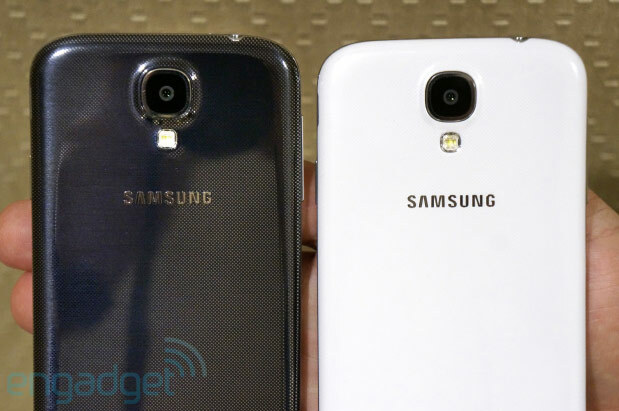 If it existed on the GS III (or Note II), then it's made the transition to the GS 4. So, Smart Stay, AllShare Cast & Play, S Voice are all there by default. But there are new additions, like S Translator, which includes support for 10 languages and is baked into apps like email, SMS and ChatOn; S Health, a lifestyle-tracking app (compatible with the Up-like S Band, Body Scale and Heart Rate Monitor) that uses the handset as pedometer and calorie counter; Group Play which connects a network of GS 4's to share music in a surround sound-like mode or networks gaming (enabled on two games: Asphalt 7 and Gun Bros 2); and an Adaptive setting to adjust the screen and volume based on user activity. There's also Air Gesture, which lets you scroll and navigate the phone without touching the phone, and Air View lets you ultimately use your finger as an S Pen, giving you a preview of emails, calendar appointments, videos and image galleries when it hovers over the screen. As for that oft-rumored eye-tracking feature Smart Scroll, that hasn't made the cut. Well, not in the way you've read about. Instead, Samsung's opted to implement the feature using Smart Stay's facial recognition tech, allowing the device to scroll through text based on tilt. While Smart Pause, another much-hyped feature under the Smart Stay umbrella, suspends video playback when you cast your glance away from the handset. Likewise, it resumes when your eyes re-train on the screen. For rear cameras, 13-megapixel sensors are standard on flagships nowadays (the HTC One being the exception). 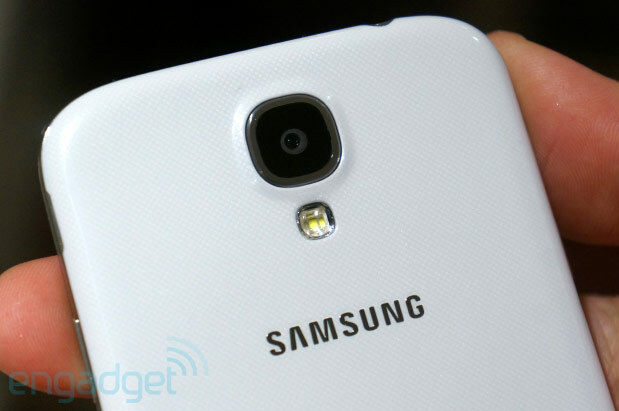 So to help the GS 4's imaging standout from the pack, Samsung's borrowed a few elements from the Galaxy Camera. Namely, its wheel mode interface. And much like the Optimus G Pro we recently reviewed, the GS 4 can do dual still and video capture, offers templates (i.e., stamp, heart shape, window, fisheye) for the picture-in-picture stills, Eraser mode to remove photo-bombers or background blur, Cinema Photo for still shots with moving backgrounds, a Sound & Shot option which records up to nine seconds of audio to accompany a still and Drama Shot, a feature that utilizes burst mode to create animated GIFs. There's also a faster lens on the menu, with an f/2.2 aperture. Overwhelmed yet? You should be. The Galaxy S 4 is a testament to Samsung's ethos: an unabashed focus on features over design, and an immense desire to fork Android as best it can. Still, as much as its add-ons differentiate this handset from last year's, we can't shake the feeling that the GS 4 falls flat next to the competition. In fact, we get the sense Samsung could've called this device the GS III Plus -- that certainly wouldn't be out of step with its naming conventions in the past. Don't mistake this preview for a final judgment -- there's still a full review to be written, and these are just our first impressions. As the next torchbearer to the Galaxy S throne, however, it levels the goodwill earned by the GS III. 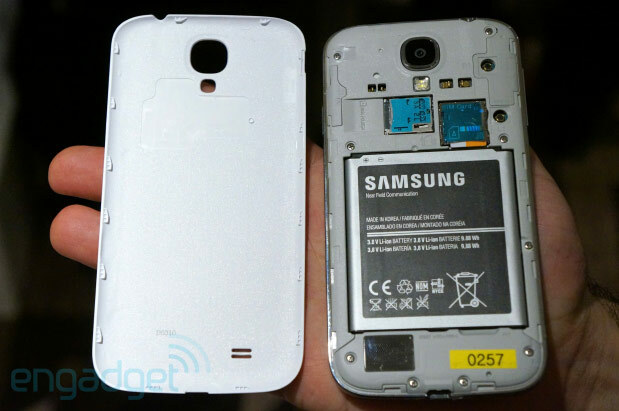 Update: It appears the Galaxy S 4 will also support wireless charging (based on the Qi standard). The global pre-production model we saw earlier didn't showcase this feature (as you can see from the in-line shot above). Here at the Radio City, however, we saw wireless charging pads and compatible backplates -- the latter of which we're told should ship with the GS 4 depending on region and carrier. Update 2: We attempted to run SunSpider on the device to get a sense of browser performance, but the test just seemed to loop. Quadrant ran just fine, though, giving us a score of 8,892 -- a result that falls far below that of the One and Optimus G Pro (both packing Snapdragon 600), but falls in line with the Droid DNA and One X+.